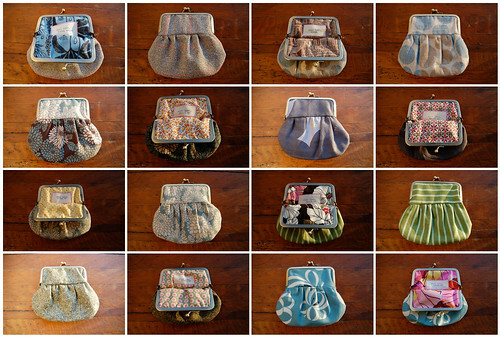 I thought about just letting all the photographs of all the snap coin purses that I made speak for themselves. There were fifteen, a few got away before being photographed. Thing is, of course, that there are some things I’d like to share with you about the process. I set up an assembly line to make these and tasked myself one step of the project each day. This made the project seem totally manageable and much less stress-y. Things were going really well, except for the fact that the purse frames had sold out in the shop and the new order got stuck in customs for almost 2 weeks. That really threw my short schedule out the window. The frames finally arrived on December 24 and thus I finally finished these yesterday. I tried using cotton batting instead of interfacing and I really like how they turned out. For this style, I just cut batting to match the top piece of purse and basted it to the lining. I trimmed all the batting down in the seam allowance, once everything was sewn together. The batting adds nice body and helps fill in the metal frame more, which I quite like. 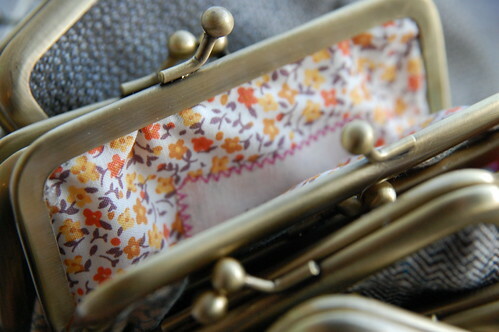 One of my little typewritten labels were sewn into the lining of each of the purses. All the fabrics were from my stash, plus scraps from various projects, skirts and dresses. I had so much fun pairing up the outside fabric with the lining fabric. After so many years of making holiday gifts, I’ve found that the best thing is to pick one thing and make many of them. Over the years, I have made stained glass night lights, hot water bottle covers, lavender & flax filled patchwork eye pillows and zippered pouches. There was no doubt that this year it had to be snap coin purses. They are the perfect gift, pretty and useful at the same time. Oh, yes, and they are fun to make! 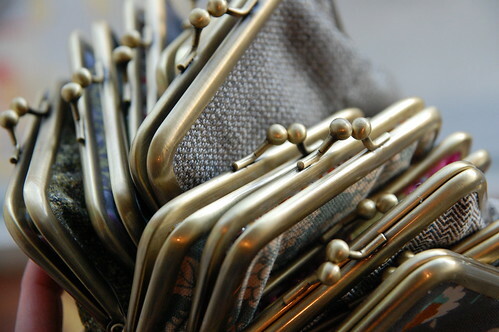 One last thing – I learned that these types of purses are called “gamaguchi” in Japan, which means ‘frog’s mouth’. That name adds a whole other dimension to these guys. I’m so jealous I’m seeing these beauties everywhere! Any chance of a tutorial for those of us who live miles away from the workroom?! Although I have yet to find the snaps for under £10 which is extortionate! 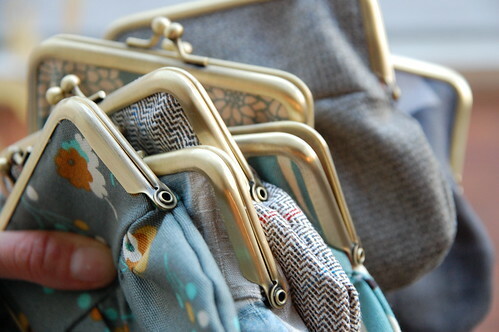 your coin purses are wonderful. my gosh. you must be full of patience. i made one last year. and haven’t made one since. but after seeing yours … i think i am going to try again. yes. again. gorgeous! I’ve used the sewing machine on paper for drawings and binding zines. but I don’t know how I never throught of it for wrapping. Great idea! i love them karyn. this is an adorable post and i love your snap coin purse mosaic! all i can say is, lucky be those on your gift list!!! Just lovely! What a gorgeous little stack of productivity!! Well done! 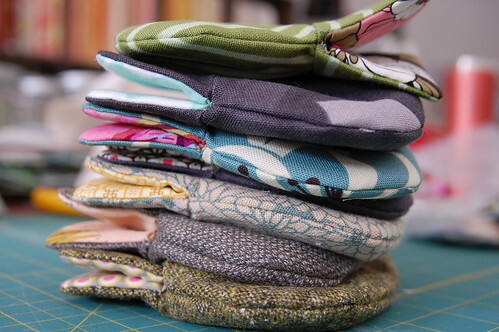 LOVE all the cool fabrics you use….so pretty! Are these for sale? I would love to provide these to my bridesmaids as gifts. Is it possible to purchase a pattern/tutorial for these? I’ve been googling like mad, but can’t find anything similar and they are so adorable. Thats a very cute idea! !